Possblity Renesmee. Now EW.com has learned that little 9-year old Mackenzie Foy is inches away from signing on to play Renesmee.. Wallpaper and background images in the renesmee carlie cullen club tagged: renesmee nessie renesmee carlie cullen twilight. 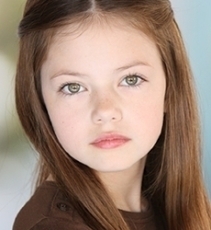 This renesmee carlie cullen photo contains retrato, headshot, close up, and closeup. There might also be outerwear, overclothes, vestuário exterior, roupas normais, bem vestido pessoa, terno, calças de terno, terninho, pessoa bem vestida, terno das calças, pantsuit, terno de calça, coat box, and casaco de caixa. Now EW.com has learned that little 9-year old Mackenzie Foy is inches away from signing on to play Renesmee, Edward and Bella’s vampire/human love child that’s a central role in the final installment of The Twilight Saga: Breaking Dawn.It’s not yet clear how the diminutive actress, who’s appeared in one episode each of television shows FlashForward and ‘Til Death, will portray the character who ages a full 17 years in only seven. Sources have suggested that director Bill Condon will employ similar digital effects to those used by David Fincher in The Curious Case of Benjamin Button, where Foy’s face would be digitally transferred onto the face of a younger child. It’s also probable that the studio will hire a younger child in some capacity, too.